4 stars of glorious nostalgia for the eighties. 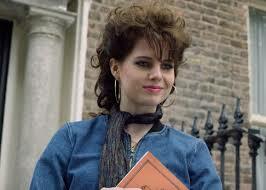 Sing Street is written and directed by John Carney (Once, Begin Again) and is set in Dublin in the mid eighties. Caught up in an economic recession, a lot of people in Dublin are struggling and the Lalor family are no exception. The man of the house Robert (Aiden Gillen – Game of Thrones, The Scorch Trials) has no work and his wife Penny Maria Doyle Kennedy – Jupiter Ascending, The Commitments) is down to a three day week. In order to save money, they decide to take their youngest son, Conor (Ferdia Walsh-Peelo) out of his private school and thrust him into the cutthroat state school system and into Synge Street School, run by the very nasty “Christian Brothers”. Floundering and besieged by bullies, he is fascinated by the mysterious girl who stands opposite to the gates every day. With the encouragement of new best friend Darren (Ben Carolan – The Cherishing), he plucks up the courage to talk to her and upon discovering she is a model, invites her to be in the pop video that he and his band are making. Of course he doesn’t have a band, and so the idea is born. 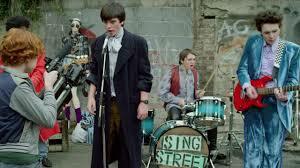 He assembles an unlikely group who call themselves Sing Street and experiment with all the different sounds, styles and genres of the mid-eighties. 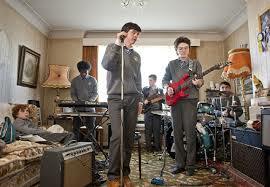 Sing Street follows the band as they learn to deal with the world together, creating great music and changing their look each time Conor’s super cool brother Brendan (Jack Reynor – Glassland, Macbeth) plays him a new record. Not forgetting of course the main aim of the operation, to win the heart of the enigmatic Raphina (Lucy Boynton – Ballet Shoes, The Blackcoat’s Daughter). Full of excellent music from the eighties, including Duran Duran and The Cure and featuring original music performed brilliantly by Ferdia Walsh Peelo, this is a real singalong feel good film. It also features a new track from Adam Levine. The pop videos which the band make capture the spirit of the eighties perfectly, it’s like hopping into a time machine. 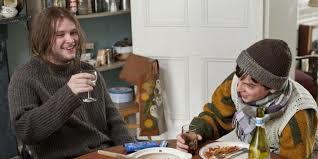 This is an extremely well written and enjoyable film, well worth adding to your collection. Sing Street is available to buy now on DVD and Blu-ray.